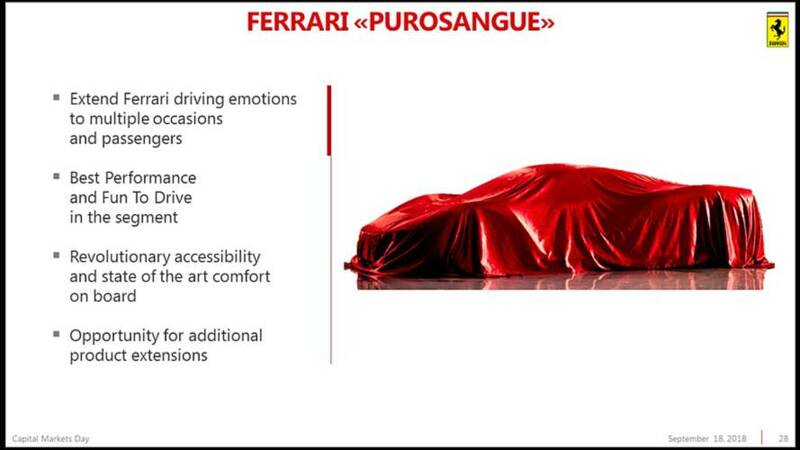 Ferrari will call its upcoming crossover the Purosangue (Italian for thoroughbred), and it'll arrive by the end of 2022, according to info from the Italian brand's future product roadmap. Be careful calling it an SUV around new company CEO Louis Carey Camilleri, though. "That word, I do not want to hear it in the same phrase as Ferrari," he said during the presentation. Camilleri offered a few details about the Purosangue, too. Buyers will be able to choose between a purely internal combustion engine or a hybrid. It'll be the brand's first-ever vehicle with a five-door body but will feature a coupe-inspired shape. In terms of size, the machine won't be as big as the competing Lamborghini Urus. 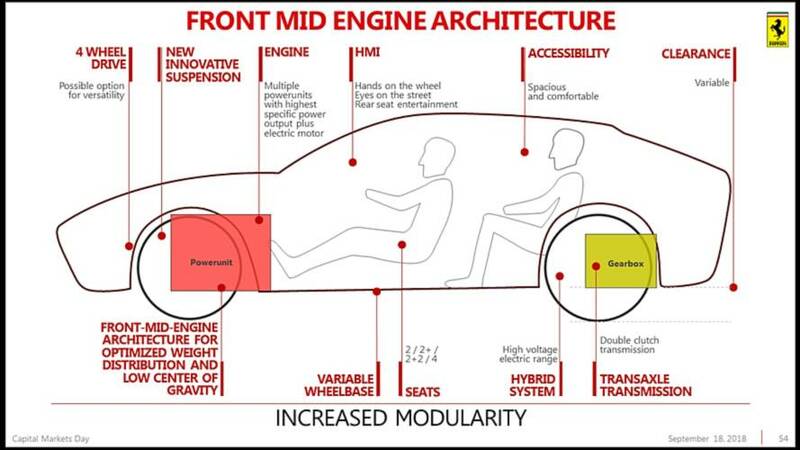 The Purosangue will ride on Ferrari's new Front Mid Engine Architecture (above). The setup will feature a front-mounted engine that will be behind the wheels, and a dual-clutch gearbox will be at the rear. This setup will provide a better weight distribution. The platform will support all-wheel drive, and hybrids will exert their electric boost to the back wheels. Launching a moderately high riding, five-door crossover will be a major turning point for the 71-year-old brand. According to Camilleri, former chairman and CEO Sergio Marchionne pushed for the Purosangue because he saw the machine as a way to respond to changing customer tastes, particularly in China. He also believed it could boost profits and sales for Ferrari, including taking Prancing Horse's annual volume above 10,000 cars a year for the first time. 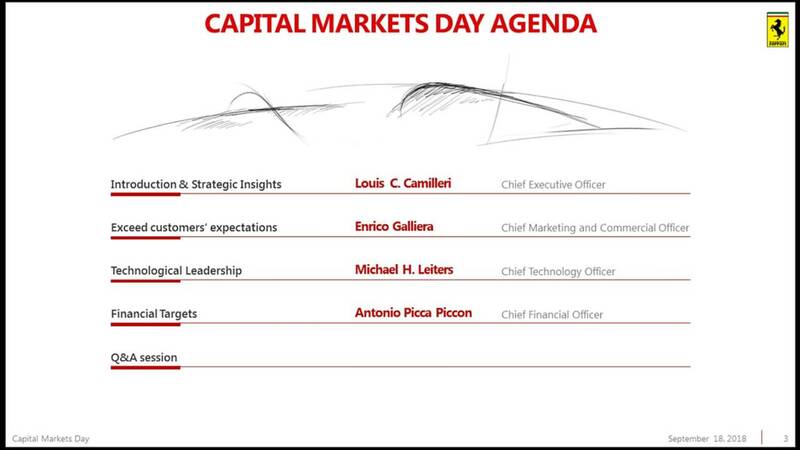 During the presentation, Camilleri admitted that he was initially skeptical about Ferrari entering the crossover market. However, the design sketches convinced him that the idea could work. Now, he's a supporter of the project.